Aviophobia affects 6.5 percent of the population. camera (Getty Images) "Aviophobia, a fear of flying, affects 6.5 percent of the population, according to the National Institute of Mental Health." Nobody zeroes in on the angst of modern day America better than comedian Louis CK. One of his best bits: Slamming cranky passengers for failing to recognize the miracle of flying. Said Louis, "Everybody on every plane should just constantly be going, OH MY GOD WOW!" He calmed down a bit to deliver the kicker: "You're sitting in a chair in the sky." Unfortunately that's the problem, if you suffer from fear of flying. A chair in the sky offers no control and no way out. Is this fear for real? Absolutely. Is there help? Yes, for most. 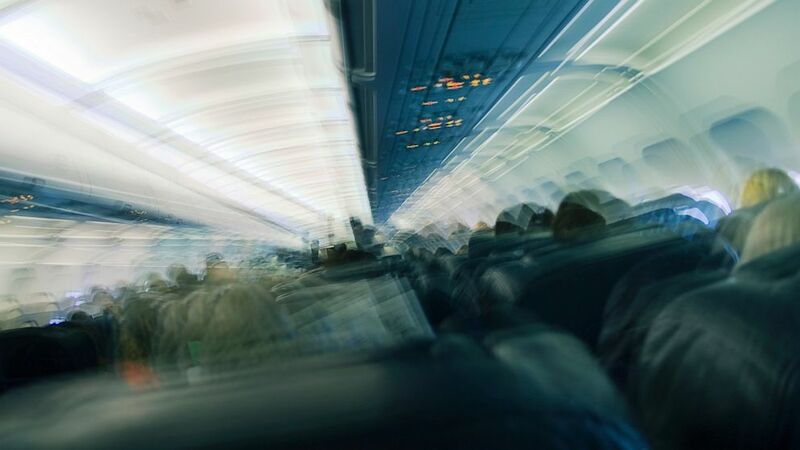 According to some estimates, as many as 25 percent of all Americans suffer some nervousness about flying but the National Institute of Mental Health says this fear, usually called aviophobia, affects just 6.5 percent of the population. Did I say "just"? That's more than 20 million people! It's not so much fear of crashing (though that is why Blink 182 drummer Travis Barker dropped out of an Australian tour this year, but he was involved in a horrific private plane crash). Most cite a sense of powerlessness and yes, a feeling of being trapped. Can airlines help? It would seem logical since they want your business. Air France does offer workshops on the topic and so does UK-based Virgin Atlantic. The latter's day-long seminar called Flying without Fear explains how planes work, includes Q&As with pilots plus therapy sessions and they top it all off with a short flight. While I can't endorse this program or any in particular (remember, I'm an airfare guy and not a doctor), Virgin claims an enviable success rate of 98 percent. •	You Asked: fear of flying •	Alex: Flying is the safest way to travel. The safety of our customers and employees is our top priority. Alex makes a good point: Flying is the safest way to travel. In fact, 2012 was the safest year for aviation ever, but you probably don't need to see the statistics; just think back to your last fender-bender then compare it to the last time you were in a plane crash. But safety statistics don't help those who panic at the thought of being "trapped" though there is an app for that. In fact, there are tons of apps for flying phobias, along with innumerable books (and ebooks) but many say there's nothing like conventional one-on-one or group therapy with a mental health professional. Does that work? According to the NIMH, "Specific phobias respond very well to carefully targeted psychotherapy." Cognitive-behavioral therapy is also said to be useful in treating anxiety disorders as are stress-management techniques. One problem: Too many are embarrassed to seek help, figuring (wrongly) that they should "just get over it," which is the kind of well-meaning advice you can expect from the non-phobic. I'm told it's extremely difficult (if not impossible) to do this on your own, but remember, it's nothing to be ashamed of and you're not alone. Some find it helpful knowing others feel as they do, and there are fear-of-flying forums all over the Internet (although the NIMH says treat any online advice "with caution"). For those who prefer personal contact, ask your doctor for a recommendation. You can also search "fear of flying" plus "group therapy" (or classes or workshops). You may want to investigate this list of resources from the non-profit Anxiety and Depression Association of America. Here's an unusual route to recovery: North Carolina businessman Clay Presley survived the 2009 Miracle on the Hudson (a gallant US Airways pilot expertly glided his crippled plane onto the icy river) but he was left with a fear of flying. His solution was learning to fly. A bit extreme perhaps, but he is back in the air and is glad to be there. I imagine other phobic-flyers would love to soar again too. So, don't be like the John Madden who spent his days between color commentary for NFL games criss-crossing the country in a customized coach-bus (though come to think of it, he certainly missed a lot of fees and TSA security lines). Find a way to get back up there. Get help. Wouldn't you love the freedom of flying? I know I'd love to have a former fearful flyer as a seatmate. I'll even share my electronic device with you so you can choose another movie in case the airline is showing the movie "Flight" or "Snakes on a Plane".